1. Wash and prick the baking potatoes. Bake in a pre-heated oven at 200C/180C Fan/Gas 6 until soft in the middle. 2. Slice the leek and cook on a low heat with the butter for 10 minutes. 3. 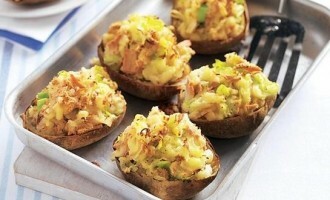 Cut the potatoes in half and scoop out the middle, leave the shells intact. Mash the potato with the leek and milk. Flake the tuna into the mix with the cheese. Season and stuff back into the shells. 4. Cook in the oven at 200C/180C Fan/Gas 6 for 15-20 minutes.